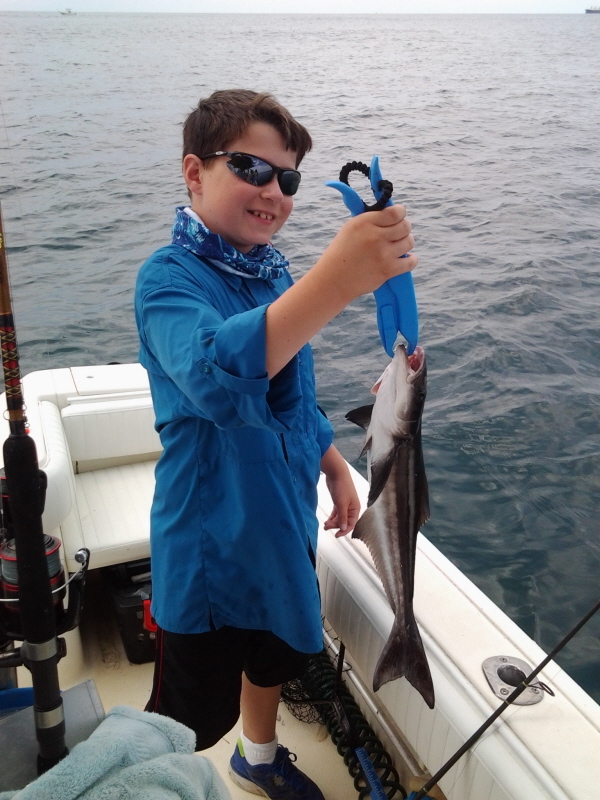 The cobia have showed up! Some days sight fishing is paying off and other days there are more being caught bottom fishing. 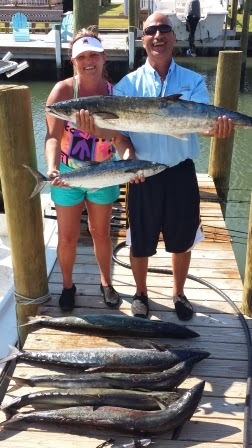 The blue fish and spanish mackerel are showing some good numbers along the beach. 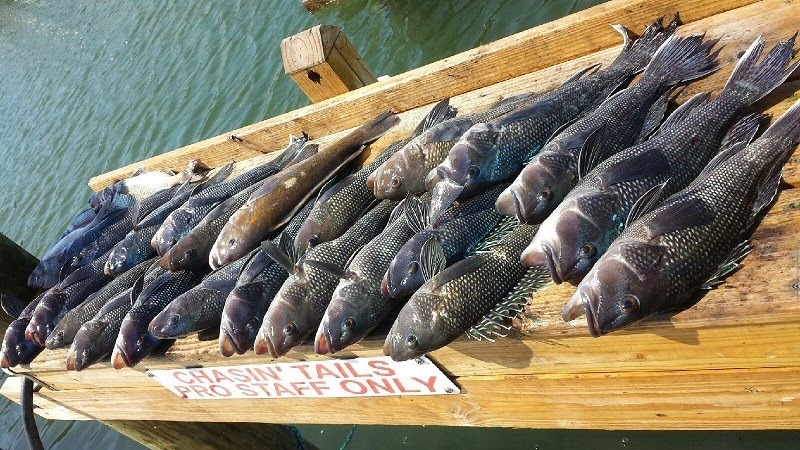 The offshore bottom fishing is still good with good numbers of sea bass and amberjacks. 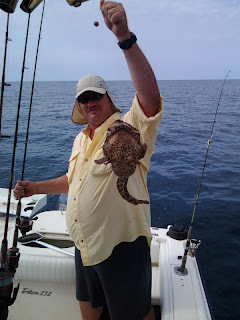 We also had a good surprise of a few big bull drum caught in the surf. I have been out of town for a few days but the fishing has picked up. Nearshore the Bluefish and Bonita's are working around the reefs, the flounder bite is starting to pick up, and the Cobia should start up anyday. 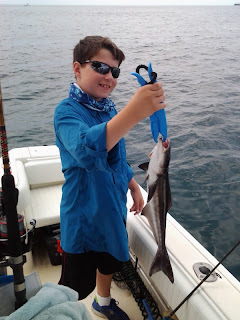 The Cobia run is one of greatest times around here so if you have never had a chance to fish it come book a trip. 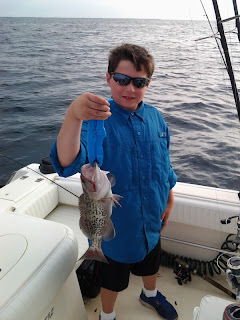 A little further offshore the seabass, triggerfish and grouper are doing well. 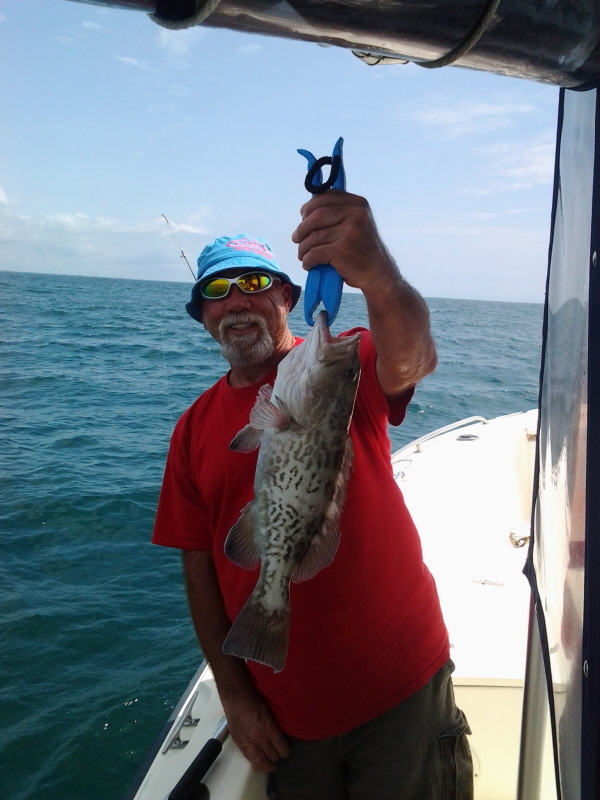 Grouper season just started May 1st, so now is a good time to get one before the get a lot of pressure. The fishing is picking up more and more as the weather warms. Bluefish are moving into the inlets and near by reefs, seabass are on the wrecks and rocks from 12-16 miles out, and flounder are starting to show up on the reefs. 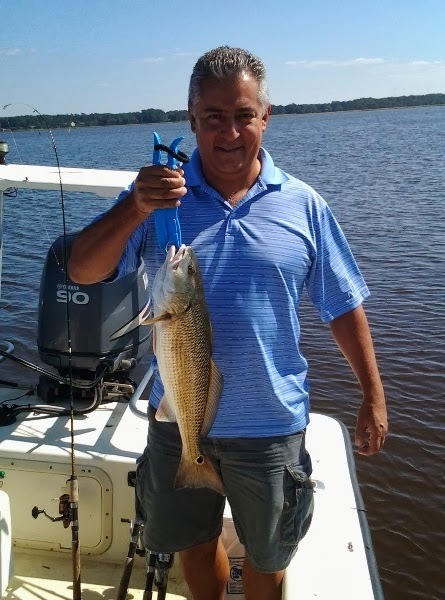 Inshore there are still a few drum and trout around the creeks and some sea mullets are around the turning basin. The fishing season is coming upon us. 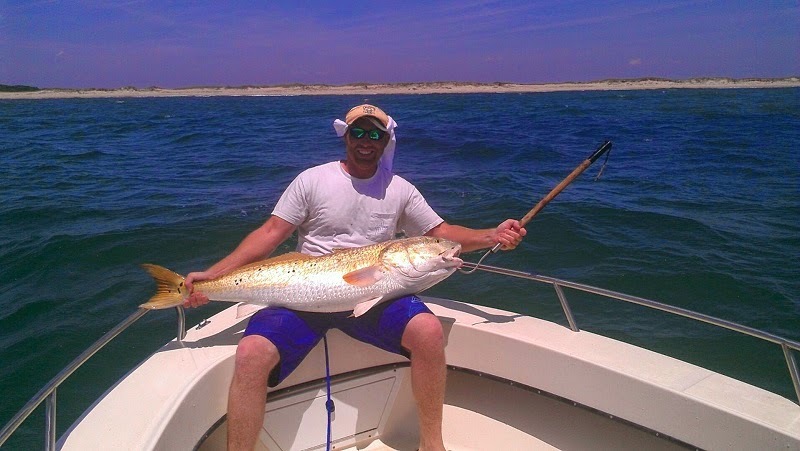 There are few schools of red drum along the beaches that are starting to make their way into the marshes, bluefish are starting to show up on the reefs, albacore are still off the beach, and the spiney dog fish are around the inlets and reefs. 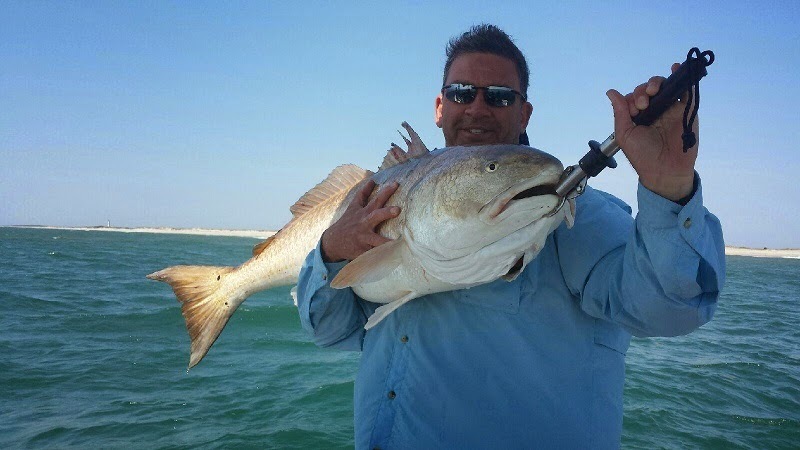 By May our fishing will be getting in full motion so go ahead and contact us to book a date. I know this is the slow season for fishing but it will be here before you no it. Already have a few dates filling up, so if you are interested in booking a trip go ahead and let me know. I have a new ride this year. I recently got a gorgeous rebuilt potter hull Seacraft. 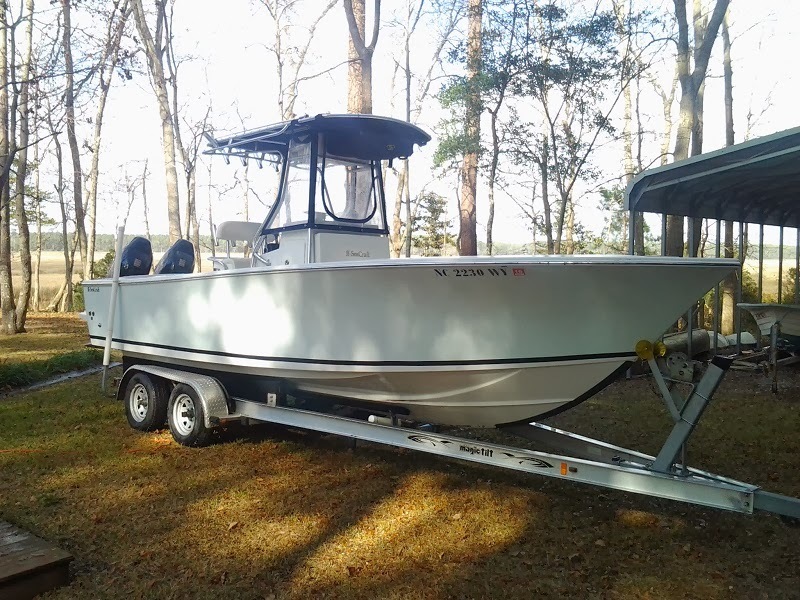 This is a sweet ride and differently a fish catching machine. Sorry for not having pictures on my last update. I have had some technology difficulties. So here are pictures from the last couple weeks. The fall fishing has really been on fire lately. Speckled trout are really starting to so in good numbers, still catching flounder around some creeks, red drum are being caught in the marshes and along the beach, and schools of albacore and bluefish are still in the ocean along the beaches. Don't let the cold weather slow you down on the fishing, we are still booking trips and catching fish! Like I was hoping the kings have showed up. Hopefully with no storms forthcoming they will stay around for a while. 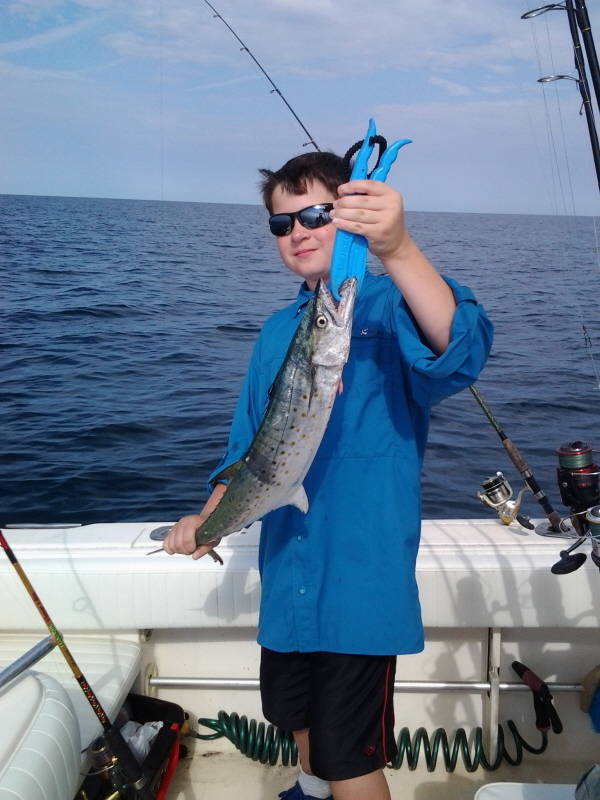 Along with the king mackerel, there are plenty of spanish mackerel, bluefish, and flounder around inshore. Sorry for not having many post lately. 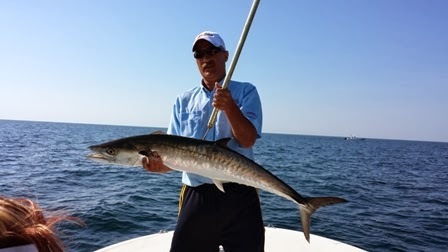 In the last couple of weeks the spanish mackerel and bluefish have really started showing up in good numbers, having some days where we limit out. 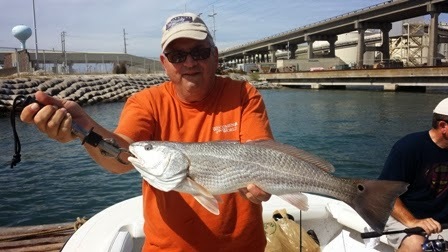 Also, the fall inshore bite is starting to pick up. 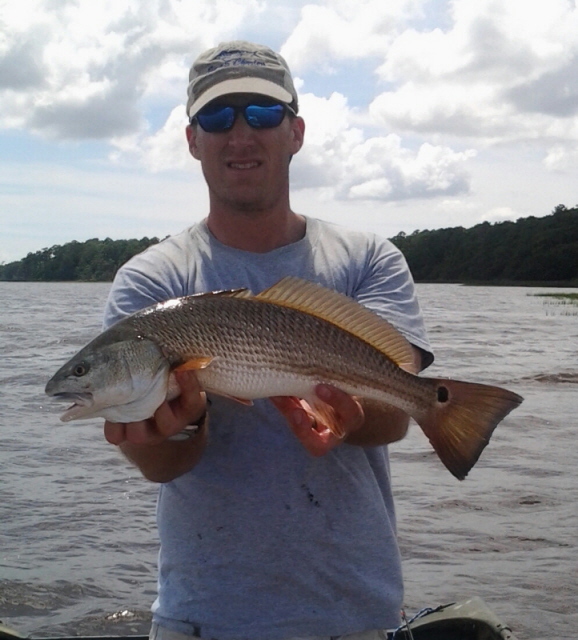 With lots of shrimp in the marsh still the red drum and trout are starting to fire up. Of course one of my fall favorites will be showing up in the next week or two, the king mackerel. Bait is starting to stack up on the beaches and it won't be long until the kings start screaming. 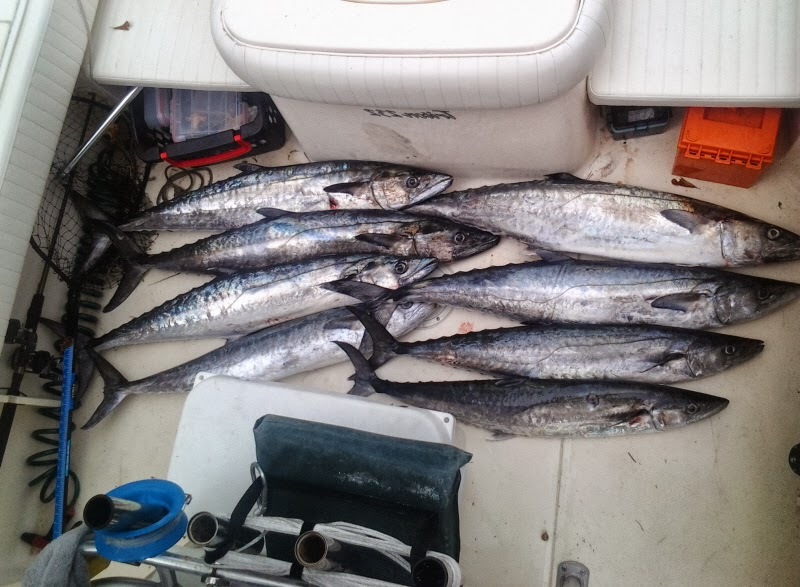 The fishing has been pretty good this week with some good numbers of spanish mackerel and bluefish showing up, and flounder on some of the wrecks. 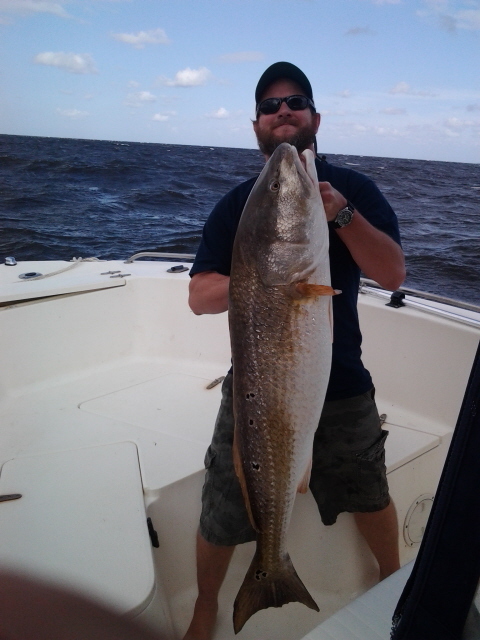 Along with the ocean fishing picking up this week the big ole' drum are showing pretty good numbers. The fishing has been good the last couple of weeks. 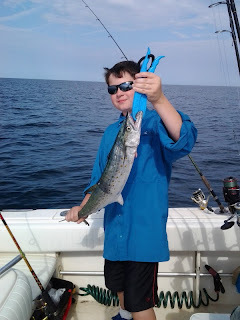 We are catching lots of sharks behind shrimp trawlers, catching lots of fish on the reefs, and finding an occasional school of spanish mackerel to cast to. On this trip I had a great father son team who caught around ten different fish species. We had a lot of spanish, a couple flounder, grouper, sea bass, sharks, cobia, and some other bottom fish, like this trophy oyster toad. 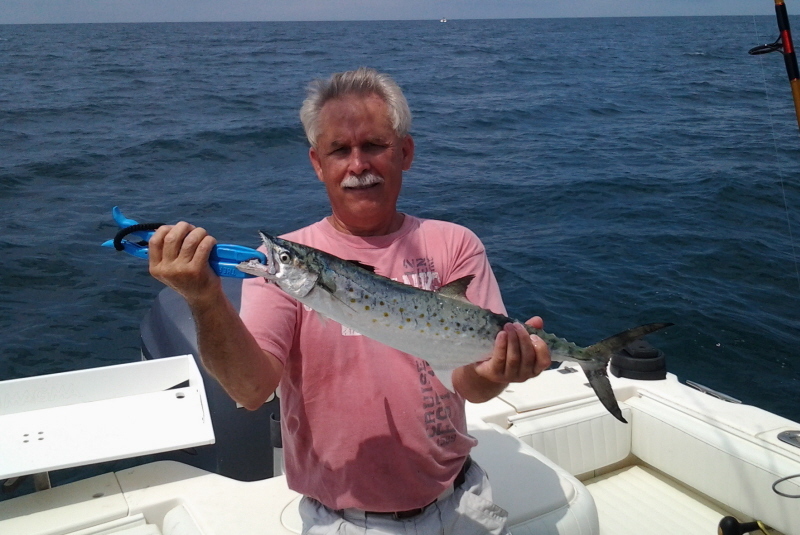 On what pretty days we get have been catching some big spanish mackerel using live finger mullets, and a good variety of bottom fish. Inshore we are still having a good bite on flounder and red drum. After letting the weather clear from the rain for a couple days we headed up the river in search of a few drum. 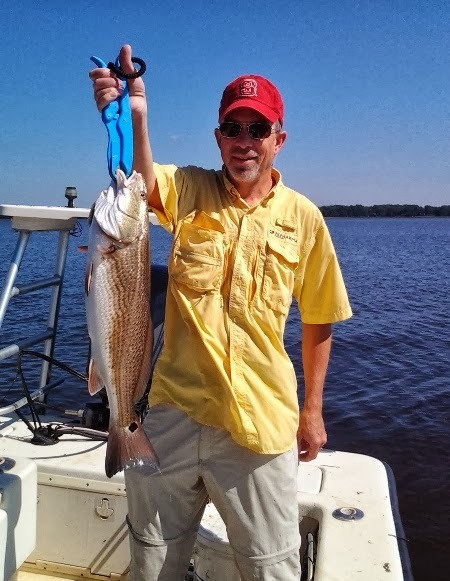 Fortunately the water wasn't to dirty and a find a few red drum.